Last night we celebrated my 35th Birthday a few months late thanks to my Mom and Dad…. They got me tickets to see Hall and Oats at Red Rocks! We have been lucky enough to see a total of 3 shows here at this “Bucket List” venue (Incubus and Kings of Leon). We always get there early for parking and tailgate but last nights tailgate was epic and JUST my style! Ya, I brought homemade cake to Red Rocks!!! BUT the crowd was older and all the people around us had wine, some brought SUSHI…SUSHI to a tailgate and I even heard groups of people talking about what books they are reading! I mean really I FOUND MY PEOPLE!!!!!!!! Lucky for me I watched the weather carefully and knew it might rain but I vastly under estimated how cold it was….. I was not warm enough in my 2 layers that is for sure! 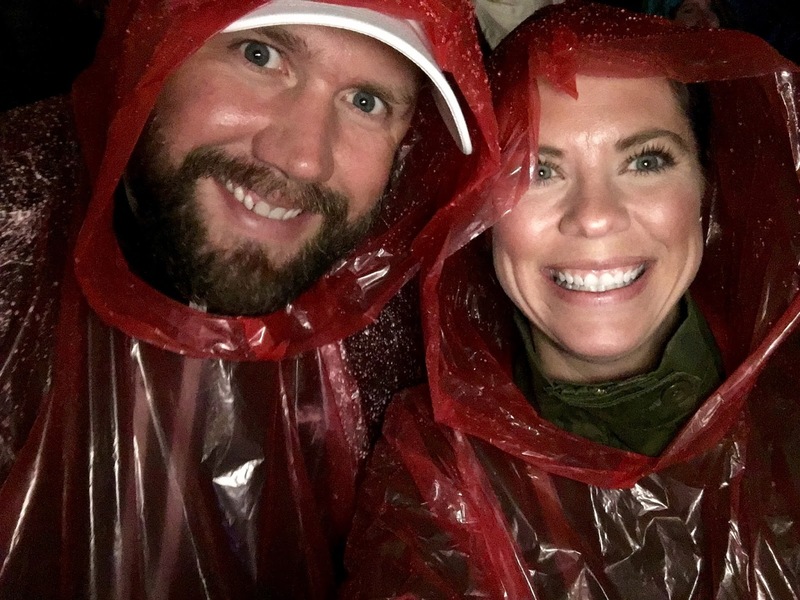 Around 8:45 when Hall and Oats took the stage the skies OPENED up…. I mean do you see the rain in the lights? It was kinda awesome! Some people say that a Bucket List event is seeing a concert AT Red Rocks IN the pouring rain and well, CHECK!!!!! I am SOOOO glad we brought ponchos but it poured!! We had a great time singing to my oldies in the rain!! Very epic! Next Post Game Days are HERE!